Packing Avy Gear & Washing Powder for Saas Fee. As an ex-seasonaire Chris Tomlinson is not used to packing his bag for a week's skiing - or for four star hotel restaurants. It had been eight years since I’d been on an actual skiing holiday, so packing for my trip to Saas Fee was difficult. I’m more used to throwing most of the things I own into the back of a Land Rover and heading south, hosting a ski chalet throughout the winter. I hate packing. Most mornings I find getting dressed troublesome, so deciding what I’m going to wear for a whole week is an extremely arduous task. Usually I find it easier to pack for a skiing trip than for other types of holidays, because I know, more or less, what I’m going to wear - the same outfit every day. My skiing outfit goes in the case first, with a couple of extra base layers and a few pairs of technical socks. Although my favourite skiing socks, being physiologically critical to my performance, often remain on my feet for the duration of the trip. Next, I pack the prerequisite number of underpants. After that, there isn’t a lot of room (weight) left, so a few select tee shirts and a backup pair of trousers are thrown in. When deciding on evening attire I usually don’t have to stand in front of the mirror for very long either. The dress code in France is casual – or at least it is in the resorts I’m used to visiting. But this time I was staying in a four star hotel in Switzerland, so I added a few shirts with collars too. Since I last performed the heinous task, there seems to be far more equipment on my packing list. Skis, boots, poles, helmet, goggles, transceiver, probe, shovel, airbag, water bladder, Swiss army knife, compass, head touch, first aid kit, gaffa tape and paracord - it felt like I was going on an expedition not a holiday. 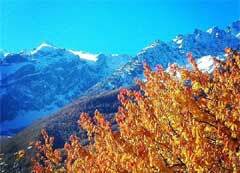 This time, packing was even easier because I would remain in the Alps for three weeks. I simply needed to pack all the tee shirts I owned and some washing powder - because nobody owns that many pairs of underpants. I set off feeling like Ranulph Fiennes, dragging my suitcase as a sledge behind me with ancillary equipment bags slashed to it. I didn’t realise it, but I too was heading to a world of ice. I’d been told that Saas Fee was a 'mini Zermat' with its electric cars and chocolate box architecture. However, nobody had prepared me for the high altitude skiing and the drama of the epic mountains it nestled in. I’ve seen some snow-covered mountains in my time and become a little blasé about mountain vistas. I’ve been to neighbouring Zermatt and gazed on the Matterhorn, but the Saas Fee Valley still managed to drop my jaw, in fact I spent most of the week with my mouth open. The village itself is surrounded by 4000m peaks (13 of them), making it a cold and shady place, which I found slightly claustrophobic. Ice spills out from many of the cols between the peaks. Look up, in almost any direction and a glacial wall is making its way down towards you. Skiing on the glaciers proved exhausting. Not because the runs were difficult, in fact it’s a very beginner friendly ski area; nothing I would call a black run,seems to exist. It was exhausting because any exercise at altitude is aerobically challenging. Just walking up the stairs to the Allalinhorn Restaurant (3500m) from the funicular that serves it, was difficult. My group of sixty-somethings had to pause halfway up, set up a base camp and rest, before pushing on to the summit. The vistas were not the only thing that dropped my jaw. The cost of food and drink was equally staggering. Saas Fee is not a place I could afford to go to very often. I was lucky that the Ski Club of GB were picking up most of my bill. I concluded that you’d have to be a very rich man to get drunk in Saas Fee. In this respect it’s a good place to dry out – it’s effectively a Swiss clinic for recovering alcoholics. I didn’t need most of my safety equipment although I dutifully carried it everywhere I went. 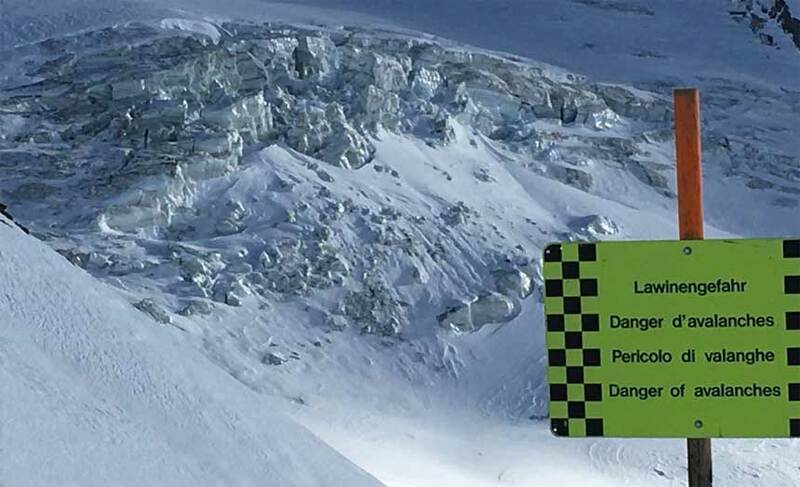 Skiing off–piste on the glaciers is not allowed or indeed advisable. While packing to leave I noticed that half the items I’d thought essential to take had not been used and the powder skis I’d taken had been inappropriate. As I packed my sledge for departure, I hoped the Club would send me back to Saas Fee next season. It is an intimidating but magical environment to ski in. 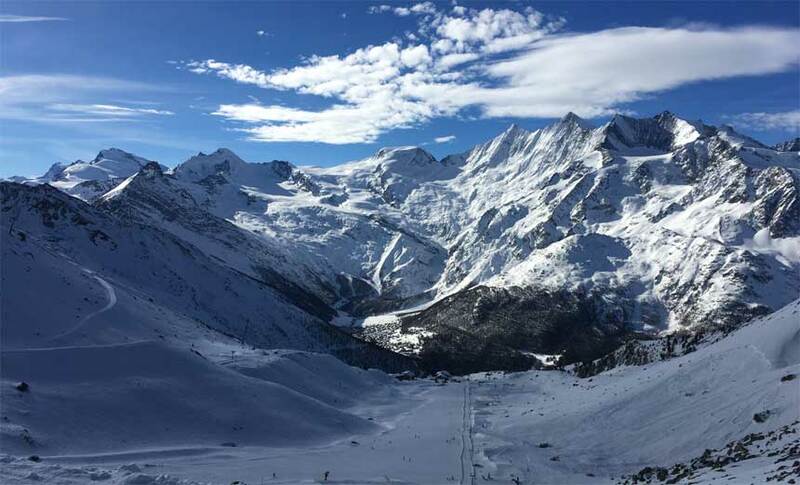 To compare mountains and ski resorts is a subjective and therefore foolish preoccupation, but Saas Fee is place I’d heartily recommend to anyone who loves big mountains and has recently inherited a fortune. Chris Tomlinson’s books (the Skiing With Demons series) can be bought online here.